I wish more watches would incorporate this type of lume in their dials and bezels. I love the soft warm glow of the gas tube that can do this without the need for charging. 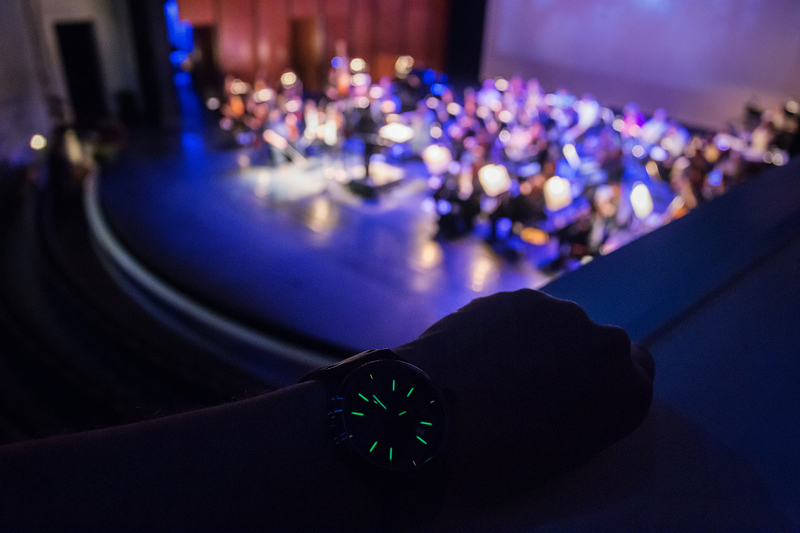 I was shooting an opera performance in a very dark venue and while moving up and down behind the stage and along the pitch black peripheral hallways on the side of the theatre, it really helped to be able to tell time and the remaining time of the piece by using the watch. This allowed me to time different angles during different parts of the performance. Tritium gas tubes make a truly functional time piece. Although they don’t glow as brightly as a fully charged Super-Luminova dial marker, they glow much longer a lower intensity which allows the eyes to adjust much quicker to them at night versus being blinded by Super-Luminova (which only lasts a couple hours anyways when charged). At this stage, gas tube lume technology is still not advanced enough for them to create non-linear tubes so from a design perspective, using this as lume is very limiting as there cannot be curved or rounded markers which is requisite for many different styles of dial markers. I would love to see this technology used in the Speedmaster’s though as it has a linear dial markers anyways. Maybe in the future Omega?